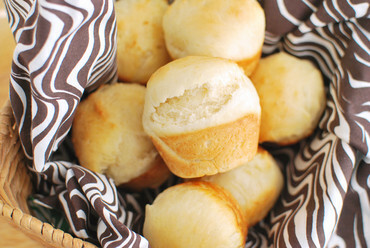 A quick no-knead dinner roll that will add homemade goodness to any meal. This recipe is featured at Fake Ginger. In large mixing bowl, combine 1+1/2 cups flour, yeast, sugar and salt; mix well. In saucepan, heat water and shortening until warm (120-130°F; shortening does not need to melt). Add to flour mixture. Add egg. Blend at low speed until moistened; beat 3 minutes at medium speed. By hand gradually stir in remaining flour to make a stiff batter. Cover; let rise warm place until double, about 30 minutes. Stir down batter. Spoon into greased muffin pan cups. Cover; let rise in warm place until double, about 20-30 minutes. Bake at 400°F for 10 to 15 minutes until golden brown. Remove from pans; brush with butter. Cool. *You can substitute Instant (fast-rising) Yeast in place of Active Dry Yeast in batter/no knead recipes. When using Instant Yeast, expect your batter/dough to rise about 50% faster. Adjust your rise times accordingly. Traditional methods: use equal amounts; Bread Machine: use ½ tsp Instant Yeast OR ¾ tsp Active Dry Yeast per cup of flour in your recipe. Visit our Lessons in Yeast & Baking for more information on baking. accident years ago and can’t see e-books well. Absolutely love your recipes. We have printed ebooks available through our Carol’s Club program: https://redstaryeast.com/products/carols-club/. You are saying large muffin cups.. does this mean the standard size like a cup cake size? Or the Texas biggies?